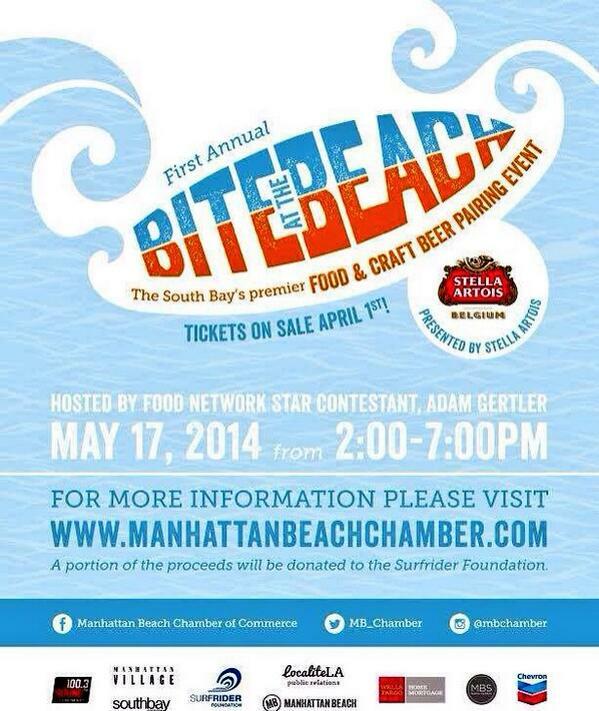 This Spring, Los Angeles will be introducing the First Annual Bite at the Beach, a premier craft beer and food pairing event, featuring over 20 craft beers in a variety of styles, deliciously paired with tastes prepared by noted chefs and food purveyors on May 17, 2014. Guests will indulge in signature bites from restaurants throughout the South Bay which will be paired with a specific craft beer. Some of the restaurants involved are MB Post, Fishing with Dynamite, Coni’Seafood, Darren’s Restaurant and Paul Martin’s American Grill along with many more. Local breweries include newcomers Ohana Brewing Company and Alosta Brewing Co along with The Bruery, Strand Brewing, Dude’s Brewing, Monkish Brewing, King Harbor Brewing and others. Also debuting at this one of a kind event, will be a number of informative panel sessions hosted by Food Network Star contestant and host of FX Movie Download, Adam Gertler. “The Art and Craft of Beer Pairing” includes a panel of Cicerones and beer connoisseurs, such as Christina Perozzi – Goose Island Educator, that will teach the crowd the art of pairing beer with food and what to look for in a brew. The second panel, “Fun with BEER” will discuss the varied of beer such as utilizing it to wash your hair, marinating a steak and even fixing your lawn. Each panel will be comprised of top notch chefs and experts guaranteed to peak your interest. VIP Tickets: $200 – includes special hour prior to event start time with passed apps by Circa, tastings of Sam Adams Barrel Room Collection and a special presentation by Pacific Gravity Home Brew Club in addition to food, beer, wine and panel discussions. Visit www.biteatthebeach.com for more information and to purchase tickets.